Transparency and traceability of industrial construction projects is not only of great benefit in terms of time and money for all project participants, but is also an essential success factor for lean construction projects to ensure a clean and trustworthy cooperation. The reality is often different, however, because suitable measuring tools and software and their shared accessibility are lacking. This is where FARO’s Traceable Construction concept comes in. 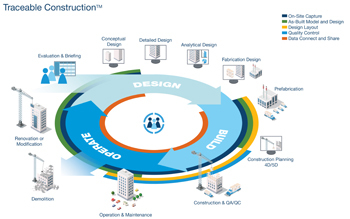 ‘Traceable Construction’ concept is the ecosystem of products and solutions that FARO offers to leverage the benefits of measured data throughout the various stages of design, construct and operating projects in the built environment, said FARO’s senior product manager, Oliver Buerkler. The company recently announced the Traceable Construction concept at the SPAR3D USA Expo and the BILT Conference, held in the US. In simple words, FARO offers portable, efficient, secure and forward-looking solutions for data collection, pre-processing and evaluation for various surveying tasks in the design, build and operating phase of a construction project. This enables FARO’s customers to accelerate processes, reduce project costs, minimise waste and increase profitability. Explaining the concept further, Buerkler, said: “It is fairly well understood that the benefits of digital laser/Lidar capture are easily realised during initial evaluation and briefing stages and through design – particularly when working within a Building Information Modeling (BIM) process. Furthermore, the use of digital capture is increasingly evident on construction sites and is offering even further benefits such as increased accuracy, less re-work and better planning and coordination. “FARO does much more than create measurement hardware and it has evolved and reshaped itself over the past few years. It’s time to start thinking of FARO as an architecture, engineering and construction (AEC)-focused company that provides complete solution and not just to their ‘traditional’ customers… It is also not looking to compete against any of the established design tools but rather help integrate survey measurement and data into procedures which are already there. By focusing on digitising the real world of a construction, making progress and construction quality traceably documented becomes a reality in itself,” he said while elaborating on what FARO is looking to achieve. Buerkler stated that “as a solution provider for all applications using digital as-built data, FARO has recognised the need to share its experience and benefit with wider groups to highlight the potentially huge advantages it can offer.” It is looking to expose the ‘places where FARO plays along the project lifecycle’ to stakeholders who are of course designers and constructors but also logistics planners, cost consultants, health and safety coordinators, project managers, maintenance managers, facility operators – essentially a huge selection of construction industry professionals. Added to this, ‘Traceable Construction’ will mature and evolve over the coming years – introducing new products and tools to customers (those who purchase the hardware and/or software) as well as the users of the resulting measurement or analysis data, Buerkler revealed. By adding value where reality data is needed or where reality data meets design or construction, FARO’s solutions provide quality assurance and project confidence, he said. Understanding that there are many other built environment stakeholders that are still yet to use digital survey data and optimise reality data in their daily tasks, Traceable Construction will allow FARO to relate to their customers and the wider industry in a simpler, more effective way. Essentially, FARO has linked its products and solutions (and the data created by it to the building /asset lifecycle. This enables industry professionals to ‘see’ what tasks can be undertaken with which products and what data will be created and how it can be used. Assigning five ‘task types’ to the various stages of a project, easily demonstrates to users what solutions within the ecosystem of products are available. The five task types are: on-site capture; as-built model and design; design layout; quality control; and data connect and Share. It is widely acknowledged that many countries still focus on the design and construction aspects of BIM and mostly through 3D model creation and coordination to ultimately create 2D drawings. Whilst this is encouraging, the real gains sit firmly with the ‘data’ aspects of Building an ‘Information’ Model. The UK’s BIM Level 2 documentation outlines this process for all parties and in particular requires the use of 3D digital measurement techniques to record as-constructed conditions. The focus is very much on creating a consistently structured set of verified data, building in maturity through the stages of a project. This is a big boost for construction accuracy and one that FARO is looking to enable, support and optimise at all stages. For example, using FARO’s measurement hardware and BuildIt Construction software for validating construction completion and tolerances, is shaving large chunks of time from construction programmes all over the world whilst at the same time confirming what has been built before it is covered by finishes. This is information that can be readily ‘traceable’ during the building’s operational phase. This level of quality control for ‘on-site’ construction works hasn’t been so common in the past – FARO has proven that the solutions are readily available, that the return on investment is clear and achievable and that construction quality improvements are within easy reach. Part of the enabling solution is ‘data connecting and sharing’ – WebShare Cloud in this instance is the current place where data storage, access, analysis and sharing can take place online and then accessed by those with very little software training required. It’s democratising the data and creating helpful, meaningful data-driven design and construction decisions to be made more accurately. Whilst ‘Traceable Construction’ lists and links FARO’s significant portfolio of products that already assist many thousands of people, it is envisaged that future product developments will help stakeholders plug the reality data gaps in their projects throughout all stages. The solutions seamlessly integrates into existing customer workflows in the AEC industry. Traceable Construction is a concept which will be talked a lot more about – it will be driven by the needs of the builders, engineers, architects and others and it will be beneficial to a much wider group, Buerkler concluded.